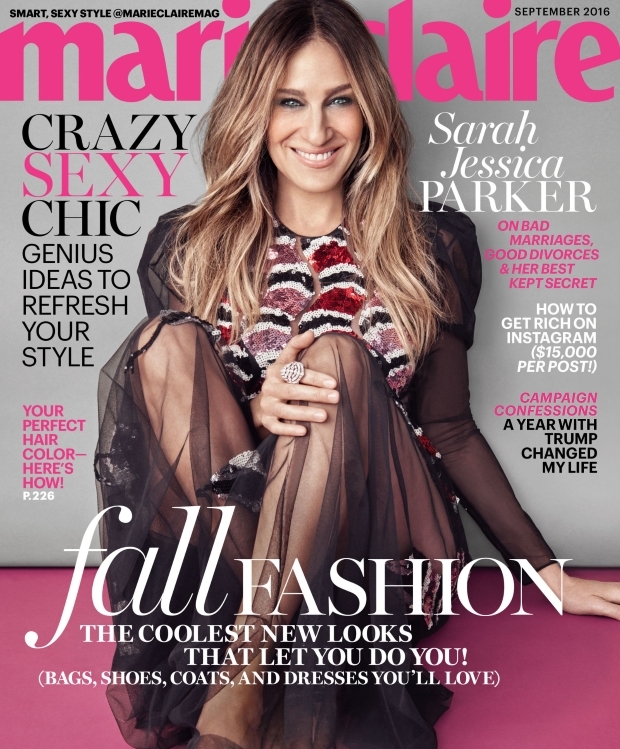 It can’t be September without a cover appearance from fashion icon Sarah Jessica Parker. Therefore, you can imagine our delight when the actress-turned-shoe designer turned up on the September cover of Marie Claire. For the past two months, the American title has failed to impress our forums with appearances from Amy Schumer and Blake Lively, but SJP brings the goods in Gucci with a fashion-forward shoot from photographer Michelangelo Di Battista. Members of our forums were thrilled with the outcome. “OK, now I’m happy!! Yes, I’m aging myself but I always love to see SJP on a magazine cover! !” applauded Handbag Queen. “It’s always a pleasure to see SJP, I think she looks lovely here. At least she’s not ruined by Photoshop,” enthused an equally as impressed Srdjan. KINGofVERSAILLES was thrilled with the cover subject. “I think this is one of her better covers (at least of the past several years) and I am dying to see her new show, [Divorce] on HBO!” he raved. “Very few women can pull off high-fashion as effortlessly as SJP! This is such a welcoming departure for September. Love the pose. Her eyes are as usual a problem, but luckily it’s a full body shot. American monthlies are really on a roll for September!” approved Benn98. “I like this color palette. It’s a nice cover, the best cover from Sarah in years,” echoed narcyza. Await more from Sarah’s cover story and join the conversation here.